If you have any questions, or want to know more, please contact us using the below contact form! Father God, we thank you that St Helens is our home, a town with a rich and productive history. May we be an inclusive community, where respect for all generations, their views and beliefs, is demonstrated through our acceptance of one another. Increase the sense of pride people have for the place where we live. We ask that in the industrial, business and retail sector there will be increasing prosperity and improved employment opportunities for all. Lord, eliminate poverty from our Borough. Give your grace to those in health and social care professions to enable them to improve the physical and mental health of our residents. We pray that vulnerable people and those with addictions will be able to access effective help and support. May this improve their quality of life, becoming free to live full lives. Enable our children and young people to receive high quality education and access fruitful leisure opportunities so they may thrive and reach their full potential. May the churches declare and demonstrate the love of God sensitively so people can experience spiritual health through the peace, hope and forgiveness Jesus Christ offers. We pray that our local communities will become happy, positive places where kindness, tolerance and respect are experienced by us all. May our Borough be increasingly known as a safe place where crime and anti-social behaviour are reduced. Give our Councillors and officers wisdom in their responsibility for the Borough and help them to plan well for the future. Grant our borough all the resources that are needed. As we look to our Borough’s future, we pray that we will be proud of its past and hopeful for its future. May it be a place of welcome, acceptance, hope, peace and joy; a place of good news where all sections of our community work well together. The Prayer150 Campaign focuses on the 150th Anniversary of the Borough in 2018 and is run by Prayer For St Helens, an initiative of the Churches to encourage even more people to pray for the well being and transformation of St Helens. 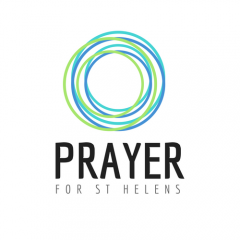 A PRAYER FOR ST HELENS – WATCH NOW!